I’m proudly South Australian, but growing up as a Croweater, I never really came to understand the emotional depth that footy had in Victoria, until I became a Melbourne resident. As an example, the 1973 Semi-Final Footy Record featured this spread on radio’s VFL around the groundsmen. Sure, we had our Jim Slavens, our Mick Clinglys, our Horrie Nelsons, our Nipper Christies in SA, players of a similar ilk to many shown here, but they never warranted a spread in a finals Budget, or much of a mention at all. These chaps have some prescient commentary on the then-modern game as well as impeccable fashion sense. I’m guessing that each state could lay claim to its own distinct memories of blokes (because they were all blokes back then) who performed a similar thankless role in those times of four/five/six simultaneous Saturday contests, each hoping to report on “the close one”. Drop us a comment if this stirs up any memories in your neck of the radiowaves. Loved the around the grounds in Adelaide in the early to mid 70s. I think back then it was 5AN and 5AD? When I wasn’t at Prospect Oval I listened to the around the grounds on Dad’s old philips AM radio in his shed. I think Eric Freeman and Max OConnell might also have been among the around the groundsmen. Preview for every game before the 2.20 bounce, regular scores and goal scorers during each quarter etc. Pity the commentator who had the last of the 5 matches. Would have been done by torch light in mid Winter. Thanks for the great memories Swish. Its one of the great Australian crafts we are losing, like making mousetraps and correct deployment of a hat. Vale the around the grounds man. And now to Skeeter at The Park. 1973 bit before my memories started in 77-78. 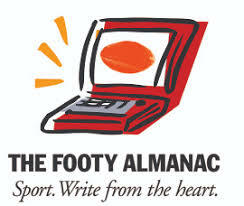 The Footy Almanac’s own Gareth Andrews was a regular Around the Groundsman for the ABC through most of the 80s. He’d always be happy when they sent him to Geelong and the Cats were winning. Not so chirpy when they were getting done. Poor George Ferry used to get sent to Victoria Park a lot and when they crossed to him in the last quarter with the Pies storming home the crowd noise would give me goose bumps. As Mic says, Skeeter was a beauty. Bobby Henderson and Ron Simmonds were two I remember from 3KZ. “Nipper” Christie – the Around the Grounds Man for all Seasons. He always “got the close one” at Thebby or the Parade. 1973 was the heyday of the big TV coverage, as exemplified by Ted Whitten and Butch Gale for Channel 9. In those days the coverage was Channel 9 for Sydney and Channel 7 for Canberra, probably the last year before 9 got out of TV coverage of footy and left it to 7 and the ABC. The true sound of Melbourne! Remember in the 80’s and early 90’s 3LO often sending both Tommy Hafey and Swan Mackay to same game for around the grounds coverage, especially if it was a big game. So, 5 stations in Melbourne did around the grounds coverage, that means there were 5 games being broadcast. So just one game would get missed per week. In Adelaide, did not 5DN, 5AD, and 5AN do the footy? That leaves two games not broadcast. Or did 5KA take a break from the hegemony of endless Eagles, Linda Ronstadt, America, Neil Young, etc to broadcast footy? Ian Cleland, Bruce Andrew, Doug Bigelow, 3UZ, 3DB,etc, etc, our world was so much smaller and more simple then. I remember listening to 3GL, Brian Brushfield,etc, then spent more time listening to the ‘Captain’ and the ‘Major’ on 3KZ. Wintry Saturday afternoons, laying in a warm bath, listening to the 3KZ around the ground , post match wrap ups. We’ve come a mile or two since then. To 6% – no there were 6. The famous 3GL/K-rock broadcasted footy, with round the groundsmen Brian Brushfield and Peter Le Grand among others. There was a fly in this ointment. There was one team playing called Geelong and woe betide the opposition if they won, when you wanted after match summary of their progress. After footy diversified as far as time slots went, they started calling NON Geelong matches and brought in Ted Whitten as chief caller, which annoyed the locals when Geelong was playing Footscray. Of course when Geelong was involved in a big match, the Melbourne stations would double up with 3GL. Fabulous memories Swish. I spent my childhood Saturdays listening to these guys and they had me hooked well before I started attending matches regularly. To pick up George’s point about 3UZ and 3DB, I think my disdain for racing was forged by those early experiences of “Bartlett running into an open goal and….racing at Morphetville…”! I always checked the Green Guide in The Age on Thursday to see which station was broadcasting the Tigers and my heart would sink if we were on either of these two! Thanks one and all for your comments. We had four stations doing the SANFL back then: 5AD, 5KA, 5AN (the ABC) and 5DN (which also had the races), so only one game missed out. I’ll add Bob Simunsen to your additions Charlie. That’d be a rare pic of Bruce Andrew. The part’s only slightly off centre! Got a few old grand final podcasts where Doug Bigelow was the special comments man alongside Peter Booth, Clark Hansen, etc. Wish I’d been around for Tommy Lahiff. He later called the Footscray games with 3WRB Harry Beitzel during the early 90’s. There’s a story about him (you can read about it in Martin Flanagan’s Southern Sky Western Oval) refusing to go down to the Carlton rooms after they won one of their early 80s premierships to interview then PM Malcolm Fraser. In short, he turned it down on ideological grounds. Can’t blame you, Tommy! Once Harry got into trouble with the powers that be when he described a filthy Western Oval day as ‘as cold as Mal’s heart’. Harry: Let’s cross to Tommy Lahiff who’s down in the rooms. What’s it like down there Tommy? Tommy: Are you there Harry? Harry? Can you hear me Harry? Harry: Loud and clear Tommy, What’s it like down there Tommy? Tommy: Can you hear me Harry? Harry? Can you hear me? Am I on? Harry: Yes Tommy. Go ahead. Tommy: Can you hear me Harry?…..